Solid Hosting Review 2019: Is Solid Hosting a Good Hosting? Philippines-based Solid Hosting is a solid web hosting provider with superior 24/7 support. It offers a complete set of solutions including shared hosting, reseller services, dedicated servers, VPS, and colocation services. Philippines-based Solid Hosting offers a wide range of internet services including shared hosting, dedicated servers, VPS servers, reseller hosting, and colocation services. It also offers domain name registration services and (possibly) SSL certificates. Solid Hosting’s old-style but well-organized website is only available in English. Solid Hosting’s hosting solutions support the Python programming language, and they include daily and weekly backups. It’s unclear if SSL certificates are provided separately since the website’s SSL page is unresponsive. Depending on the plan you pick, you can choose your operating systems from CentOS, Ubuntu, XenServer, and Windows Server 2008. VPS servers come with full root access, and all servers run on Supermicro infrastructure powered by Intel Xeon Quad Core processors for high performance and reliability. Servers are hosted in data centers in the Philippines and the U.S. 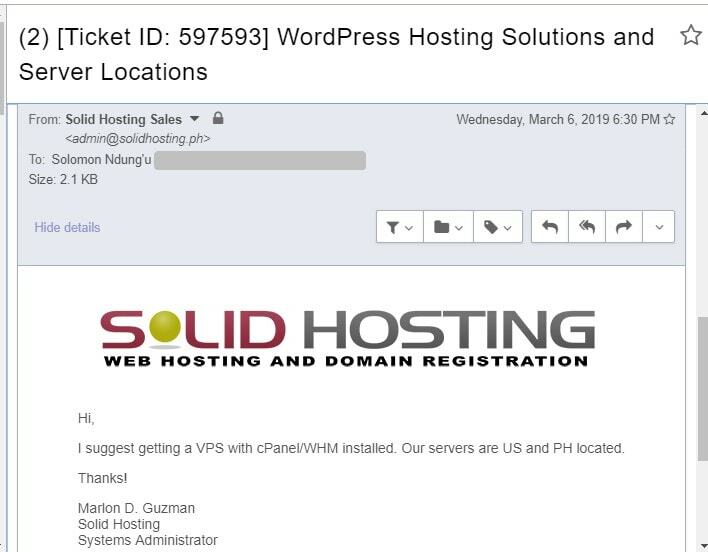 Solid Hosting offers very cheap hosting solutions, priced in Philippine pesos and backed by a generous 45-day money-back guarantee that is longer than the industry average. Whereas shared hosting customers must commit for a minimum of 12 months, the VPS and dedicated server plans also offer monthly billing. There is no network uptime guarantee. Solid Hosting’s website includes an adequate knowledge base complemented by a noteworthy number of tutorials. Solid Hosting has made its mark in the Philippines with its robust, quality hosting solutions. This vendor’s highly responsive support team is just one of the reasons many businesses enjoy its hosting solutions, so it’s a shame that the company website includes some invalid links. Get hosting with solid support from Solid Hosting. Wondering how Solid Hosting stacks up against other Web Hosting companies? Enter any other Web Hosting company and we will give you a side-by-side comparison.